Lien’s sight became impaired because of a cataract when she was just three years old. Her mother, Ly, was heartbroken; scared for the future of her beloved daughter and the difficult journey that lay ahead. 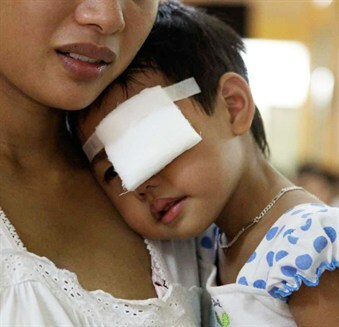 With no spare money to pay for treatment, Ly thought her daughter might be blind forever. She began to search for help and found out about a free cataract surgery campaign supported by the Childhood Blindness Prevention Project, a Seeing is Believing initiative. The day of the operation finally arrived. Ly could not stop staring at the operating theatre while her daughter was inside for the 20-minute long surgery. When the doctor finally came out of the theatre and announced that the operation was successful, Ly’s tension was released and tears rolled freely down her face. “I am so happy,” she said afterwards. “That’s the most wonderful thing that has happened in my life. My daughter can see again and have a good life”. Using our exciting expedition we hope to inspire young people across the UK and Commonwealth. If you are a teacher, register your school today to access our excellent education packages. The Coldest Journey aims to raise over $10 million for Seeing is Believing, the international charitable initiative which aims to eliminate avoidable blindness and visual impairment across the world. Donate now!